I have started every day for many years doing one thing. I read from the Psalms and I read from the NT. Right now I am in Paul’s second letter to the young man, Timothy. I love what I read this morning in verse 7 of chapter 4. 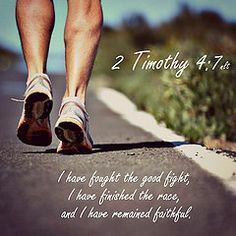 Paul said, “I have fought the good fight, I have finished the race, and I have remained faithful.” No matter what has happened to me, “I have remained faithful.” That is what Mark is talking about here. But so many people don’t do the little things that make their marriage successful, or the task God has given them, or their health. At the first sign of a problem or a failure they are ready to run. Don’t let problems or failures stop you. They didn’t stop Jesus, they didn’t stop the Apostle Paul and they didn’t stop Joseph in the OT. And they shouldn’t stop you. Just be faithful. Keep at it. "Fear is never overcome by situation avoidance."